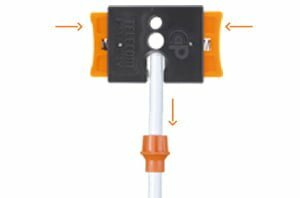 The cable preparation is slightly different from the traditional one, but the same for any cable size you may use. Here are the 5 easy steps you need to follow to get the best cable preparation for the CaP System and to get the strongest machanical hold. You can also download the instructions at the bottom of the page. Aside, click on the link to see the video tutorial for further details. 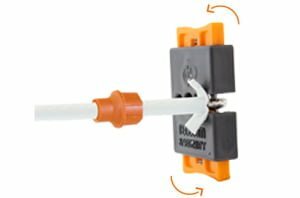 2 Insert the coaxial cable into the side slot of the stripping tool (SPC) about 1cm (3/8''); gently squeeze the blades while pulling the cable out to slit both sides of the jacket. 3 Expose the dielectric by pushing backwards the jacket and the braid. 4 Insert the cable in the round hole until the dielectric just peaks on the other side. Rotate the tool + -90° while squeezing the blades to cut and remove the dielectric. 5 The cable is ready.